He had come to Paris to report on a small boat that sailed from Israel powered only by wind energy. The crisis forced sailor and journalist to sail back to Israel together on a boat built for one. There the journalist discovers that his friends died in an explosion at the newspaper office. His pursuit of the truth leads him to The Engineer, who tells him an amazing story beginning with an Israeli rescue team that sends a Muslim girl to Israel for treatment. From this, he finally discovers who perpetrated the world chaos. Review: An adventure story like no other, A Universal Storm gives a terrifying glimpse into a possible future. Youth disillusioned by the hatred and greed in the world, futuristic technology, and ordinary people just trying to do what's right and save the world. This book takes a look at what would happen if the youth united and brought together their minds to create powerful tools to bring the world to its knees, stopping all wars, all pollution, all countries, in a heartbeat. What would you do if you had the chance to stop them and restore the world to what it was? 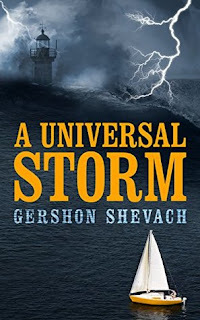 About the Author: Gershon Shevach was born to Zionist parents who fled from the Nazis during World War II but were caught and sent to a transit camp in Switzerland, on the border of France, to be handed over to the Germans. Shevach came to Israel at the age of three on an illegal immigrant ship. During the War of Independence, which took place when he was five years old, he witnessed dozens of funerals, which affected him for the rest of his life. At the age of eight, deeply impressed by the wave of construction in the newly founded state, Gershon decided to become an architect. After completing his studies in architecture with distinction he joined the army. The many wars in which he participated made him think deeply about Judaism, the State, and Zionism, and this led him to write his second book. After his army discharge, he began to work as an architect and was involved in designing millions of square meters of construction in Israel, Kenya, South Africa, Zambia, Poland, and Portugal, as well as other countries. He specialized in the architecture of prefabricated buildings, as well as protected and safe construction, and worked for Israel’s Ministry of Defense. He continues to work as an architect as well as fighting the war against cancer, because of his wife, Leah’s, on-going treatment for the disease. Despite everything, he continues to go skiing with his children and grandchildren and makes wine at the winery near his home.